Made in Britain by ETI Ltd. Reaches temperature in just 3 seconds (over 50% faster than traditional probes). Range: -40 C to 50 C / -40 F to 120 F. height 11". Supplied with a hook for easy hanging. Reasons to buy from Quickdraw. CDN's Candy and Deep Fry Thermometer (TCF400) is designed to keep track of the temperature when making candy or deep frying. Constructed of durable laboratory glass with non-mercuric column with a stainless-steel clip. The eight-inch (8 inches / 20.3 centimeters) color-coded scale includes target range and a temperature guide. This thermometer features a temperature range from 75℉ to 400℉ (25℃ to 200℃). ✷ Caution ✷ The TCF400 has a glass housing. Let it cool while clipped to the pot or place it on a dry cloth. Do not set a bot thermometer on a cold or wet surface. Model: TCF400. Kitchen Craft Stainless Steel Traditional Degrees In C & F Dial Oven Thermometer. IDEAL FOR KITCHENS, FRIDGE CHECKS. PLACE OR STICK IT ALMOST ANYWHERE. WITH STAND. 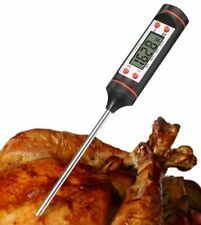 The TruTemp® Deep Fry Thermometer from Taylor features an easy to read two-inch dial and a 12-inch stainless steel stem with an adjustable pan clip. 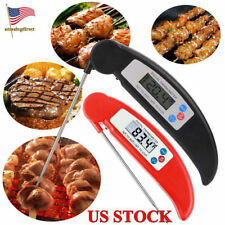 This multiuse thermometer includes common deep fry temperatures printed on the dial for easy reference. 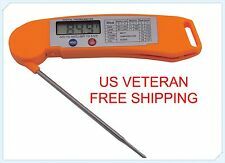 TruTemp® Deep Fry Thermometer has a temperature range from 50℉ to 550℉ (50℃ to 285℃). Hand wash only. Do not immerse in water or put in dishwasher. Made in China. Essential for any kitchen, the CDN ProAccurate® High Heat Oven Thermometer is NSF® Certified. Specially designed for use with high heat applications such as broiling, it measures oven temperatures with precise accuracy, ensuring the best culinary results! 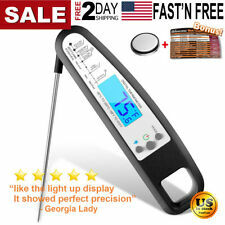 Made with a durable laboratory glass lens that resists cracking and breaking, this oven thermometer has a wide temperature range of 100℉ to 750℉ (50℃ to 400℃). In addition to culinary benefits, the CDN ProAccurate® High Heat Oven Thermometer can help save energy by ensuring that heat is not wasted by an oven that is too hot. Model: POT750X. Solve problems the Polder Way. We focus on universal daily tasks, apply our user-centred design philosophy and create products that are useful, beautiful and better. Instant readings in as fast as 8 seconds. KITCHENCRAFT Stainless Steel Oven Thermometer. Baking/Roasting/Cake Making. Superb quality as you would expect from KITCHENCRAFT. NOT suitable for use in a microwave oven. Extra large scale for seeing at a glance the temperature of your oven. Stands or hangs from oven shelf using hook. Tala Oven Thermometer . Rotating dial allows thermometer to stand or hang in the oven. .
With seven pre-programmed candy stages and one all-purpose temperature setting CDN's Digital Candy Thermometer (Model: DTC450) provides easy control over candy and other high temperatures. 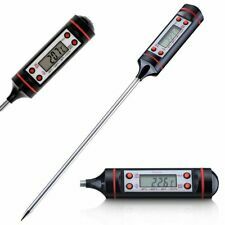 The thermometer has a stainless-steel probe that measures 8 ½ inches and can measure temperatures up to 450℉. The dual progress display shows two temperatures, the set temperature and the current temperature. Alert warnings will sound 3℉ before the low temperature, during the range, and at the high end of the range. During the two deep fry settings, the alert only sounds at the set temperature. Two (2) LR44 batteries and instructions included. Model DTP392. It also features a dual progress display with large digits, and is shatterproof. Stainless steel probe. 5.5" (14.0 cm) probe/3' (91.4 cm) sensor cable (heat resistant up to 400°F/204°C). LCD Digital Fish Reptile Aquarium Tank Water. Usage humidity: 5%~80%. it is 0.1°C, When temperature ≦- 20℃, it is 1°C. Usage Temperature: -10°C ~ 50°C(14℉~122℉). Compact design for discrete use. Accuracy: ±1.5°C. It is also very easy to operate. Four button digital display. Power source: 1x 1.5 Volt LR44 button cell (battery included). 22-11-2017 09:46:52. Deep Fat Fryers. Frozen Foods. Babys Milk. Hot Drinks. Kitchen Craft Horizontal Strip Fridge Freezer Thermometer With Suction Cups. The card has two adhesive pads on the reverse allowing it to be attached to the side or doors of Fridges and coolers. Therefore this card reads from 0 - 12°C. When the pocket temperature is 1°C above the actual temp the digits are brown. Just stand or hang it in either your fridge or freezer to instantly read the temperature. Or if you prefer use the integral magnetic mounting. Compact design, yet large enough to see the display at a glance with a wipe clean surface. 2.5 mm reduced tip (DTW450L). 6 second response. BioCote® antimicrobial technology to preserve the surface and prevent degradation caused by microbial growth. Includes operation instructions and stem cover. Range ºC: -40 to 230ºC. Range ºF: -40 to 450ºF. Brand New Sharper Image Bluetooth Intelligent Grill / Meat Thermometer, Model #1006341. Immediate payment is requested. Payment is required within 24 hours of the purchase. Suitable for Lamb, Pork, Beef or Poultry. Length of Probe: 10cm. Made from Stainless Steel. Easy to read dial showing Centigrade scale. Your Right to Cancel ?. Faulty products ?. Claims, other than the right to correction of faults with the product covered by these conditions.